The school nurse called today. As a parent I always dread what she’s going to tell me because she never calls just to chat. This time it was because she suspected my son had pink eye. He honestly looked fine heading out the door so it was a surprise. He had to go to the doctor for a note saying that either he had pink eye and has been receiving meds for it for 24 hours or a note saying that he does not have pink eye. He had pink eye, so he gets to stay home with mom tomorrow. Now my eyes are feeling weepy and itchy so I may have to see my doctor. 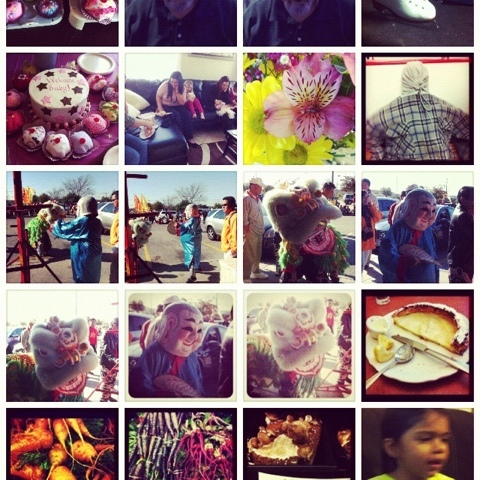 My 366 project photo tonight is a small snapshot of the photo gallery in my phone. I currently have over 700 pictures in there, I need to do some backing up and deleting before I’m unable to make a call or something. The beauty of my phone is that it is always on hand so it seems to take shot more representative of our daily life. I don’t have to pause the action to run for my camera and it’s always with me. Plus I always had the uncanny ability to forget my memory card in my laptop when we went on excursions, rendering my canon useless. This entry was posted in Instagram, Parenting, Project 366 and tagged conjunctivitis, Instagram, iphone, Pink eye, project 366. Bookmark the permalink. pink eye is very contagious, I know because I have had it myself. Little kids are very germ-y, I know that too. They will grow up as tough as weeds though, if we love them and don’t fill them with junk food or constant medication. On the subject of drugs, for pink-eye, there is much effective stuff out there!